It’s early December, which means that it is time to get those letters in the mail to Santa! On this float, featuring the North Pole Post Office, Mickey, Minnie, Goofy, and Pluto serve up a reminder to get those letters in the mail, though I suspect more children email Santa these days than actually write to him these days. 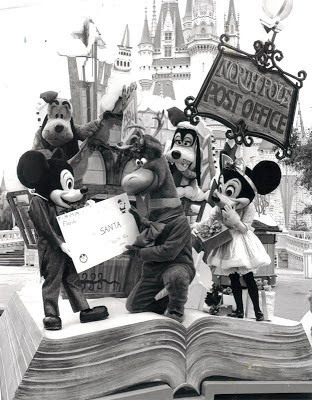 The North Pole Post Office float debuted in 1977 as part of the new Very Merry Christmas Parade that was unveiled that year. In 1977, the parade ran daily between December 17 and January 2. Whether you have or haven’t gotten your letter off to Santa, what is on your wish list this year? I wish for Disney to never forget about those wonderful, goofy reindeer -- they make me smile every time I see them!